The premiere of the opera Holger Danske (Ogier the Dane) in 1789 in Copenhagen incited political controversy; only six performances took place. With this recording, it assumes its rightful place as the first masterpiece of Danish opera. It is a rescue opera, a fairy tale and a Turkish opera all at once. "Dank an dacapo dieses Schmuckstück ausgegraben zu haben." "If I don't include this recording in my year-end list of preferences, may my right hand forget its cunning." 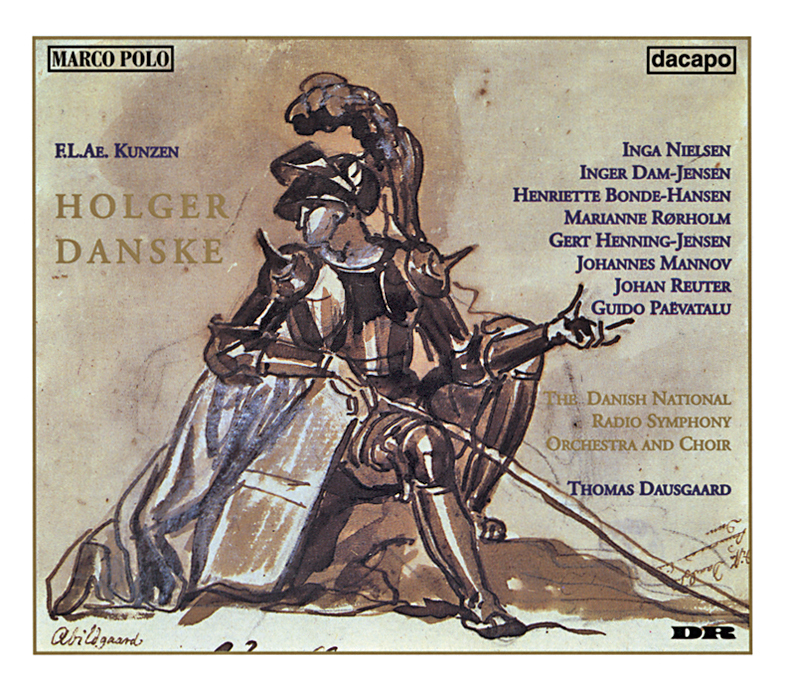 "With masterful conducting by Thomas Dausgaard, an orchestra of international caliber and recording of wide dynamic range and good balance, Holger Danske has the makings of a real sleeper." "Another marvelous discovery from Dacapo." "A major discovery. This is a truly fascinating and worthy work in an exemplary production and presentation. Check it out." "This is a fascinating and hugely enjoyable set." No. 1-4: Overture 6:35 9,60 kr. Act 1, Scene 1: No. 5 5:40 9,60 kr. Act 1, Scene 1: No. 6 Recitative, No. 7 Aria 2:26 6,40 kr. Act 1, Scene 2: No. 8 Recitative 2:59 6,40 kr. Act 1, Scene 2: No. 8 Recitative 2:16 6,40 kr. Act 1, Scene 2: No. 10 Recitative 3:07 6,40 kr. Act 1, Scene 2: No. 13, No. 14, No. 15, No. 16 4:17 6,40 kr. Act 1, Scene 1: No. 17 1:06 6,40 kr. Act 1, Scene 3: No. 18, No. 19 Chorus, No. 20 Recitative, No. 21 Chorus 2:39 6,40 kr. Act 1, Scene 3: No. 22 Recitative 4:41 6,40 kr. Act 1, Scene 3: No. 25, No. 26 2:23 6,40 kr. Act 1, Scene 3: No. 27 Recitative, No. 28, No. 29 Recitative, No. 30 5:23 9,60 kr. Act 1, Scene 4: No. 31 Duetto 1:09 6,40 kr. Act 1, Scene 5: No. 32 7:16 9,60 kr. Act 2: No. 33 5:55 9,60 kr. Act 2: No. 34, No. 35, No. 36 5:44 9,60 kr. Act 2, Scene 1: No. 37 Marcia. Chorus 2:58 6,40 kr. Act 2, Scene 2: No. 38 3:12 6,40 kr. Act 2, Scene 2: No. 39 Recitative, No. 40 3:23 6,40 kr. Act 2, Scene 3: No. 41 2:16 6,40 kr. Act 2, Scene 3: No. 42, No. 43, Scene 4 - No. 43a, Scene 5 - 43b, No. 44 5:27 9,60 kr. Act 2, Scene 6: No. 45, Scene 7 - No. 46, No. 47, No. 48 Chorus 1:19 6,40 kr. Act 2, Scene 7: No. 49 1:12 6,40 kr. Act 2, Scene 7: No. 50 Chorus 7:05 9,60 kr. Act 3, Scene 1: No. 51 3:23 6,40 kr. Act 3, Scene 1: No. 52 Recitative, No. 53, Scene 2 - No. 53a 3:58 6,40 kr. Act 3, Scene 2: No. 54 5:44 9,60 kr. Act 3, Scene 3: No. 55, Scene 4 - No. 55a, Scene 5 - No. 55b 3:12 6,40 kr. Act 3, Scene 5: No. 56: 5:25 9,60 kr. Act 3, Scene 5: No. 57 2:54 6,40 kr. Act 3, Scene 5: No. 58, Scene 6 - No. 59 Scene 7 - No. 60 Recitative 2:28 6,40 kr. Act 3, Scene 7 - No. 60 Recitative 1:30 6,40 kr. Act 3, Scene 7: No. 61 1:50 6,40 kr. Act 3, Scene 7: No. 62 Recitative 1:09 6,40 kr. Act 3, Scene 8: No. 63 Recitative, No. 64 2:37 6,40 kr. Act 3, Scene 9: No. 65, Scene 10 - No. 65a 3:25 6,40 kr. Act 3, Scene 11: No. 66 Duetto, No. 67, Scene 12- No. 67a, No. 68 Menuet 7:39 9,60 kr. Act 3, Scene 12: No. 69 2:08 6,40 kr. Act 3, Scene 12: No. 70, No. 71, No. 72 Chorus 3:26 6,40 kr.